Jian Zhang was named by the Molecular Biology of the Cell (MBoC) Editorial Board as recipient of the 27th annual MBoC Paper of the Year Award. 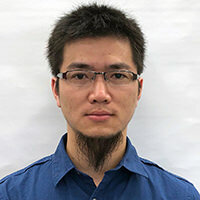 As a graduate student in Yu-Li Wang’s lab at Carnegie Mellon University, Zhang was first author of the article “Centrosome defines the rear of cells during mesenchymal migration” (Mol. Biol. Cell 28, 3240–3251), which appeared in MBoC’s Fourth Annual Special Issue on Quantitative Cell Biology. Zhang is now a postdoc at Vanderbilt University. Zhang will present his latest research at the ASCB|EMBO Meeting in San Diego in the Cell Adhesion, Motility, and Mechanics Minisymposium at 4:35 pm on Sunday, December 9. The MBoC Paper of the Year is selected by the Editorial Board from among papers published in the journal each year between June and May that have a postdoc or student as the first author.